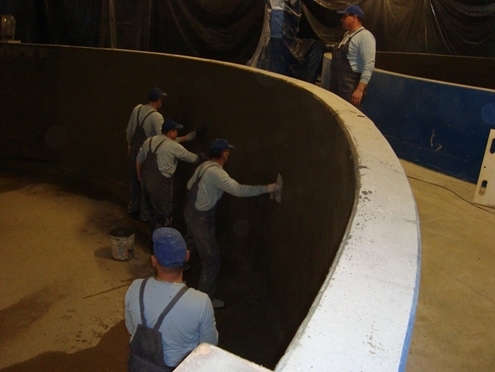 BatiPlus completed its works referring to supervision of water tanks modernization at the aquaculture of Global Fish located in Bońki nearby Płońsk. Supervised work included the modernization of 18 tanks with a capacity of about 2500 m3, in the area of corrosion protection of concrete and reinforcing steel. Global Fish is a fish farm company and supplier of premium fresh fish. Its aquaculture is located near Płońsk and it is currently the largest and most modern aquaculture in Europe with the area of 4 ha and annual fish production capacity of 1300 t. Fish are rising in a closed water circulation system using the latest technological solutions. Aquaculture is fully automated and under constant supervision. Global Fish’s business principles have been related to the promotion of the highest quality, unique, healthy and tasty products only, and that is why its fish grow in a sustainable, environmentally compatible, chemical-free and antibiotic-free way.